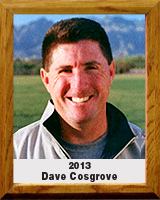 David Cosgrove began his career in soccer as the head coach of Amphitheater High School (Tucson) boys’ soccer in 1992. He is the school leader in wins and his teams made the regional playoffs each year. He played at Pima Community College on the national finalist team in 1998 and he was an academic All American that year. Since 1998 he has been the head coach of men’s soccer at Pima Community College. In 1999 Pima was national finalist and made the national finals in 2011. He has been the Arizona Community College Athletic Conference Coach of the Year five times. He has twice been West Region Coach of the Year. Pima has finished in the national top 15 rankings ten times. His teams have been Region I finalist 9 times. He has won over 200 games at Pima during his tenure. He has coached 14 All Americans and over 60 All Conference players. One player has become a professional. In 2000, David co-founded the Tucson Soccer Academy, where he has been the head coach and Board member ever since. He served as its Director of Coaching from 2008 to 2013. One graduate of the TSA has played for the United States national team. TSA has produced over 200 college soccer players and five professional players.